The blast room compartment is of panel construction, sheared and broke to form and Atlanta “T” bolted together, fabricated of 10 gauge steel. One (1) set of double panel, 2″ square tubing frame, hinged work doors, located on one end of room. 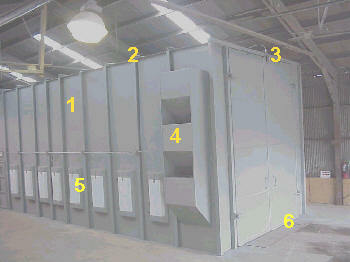 These doors are self-sealing, swing type, for manual operation. All required air intakes and exhaust plenums constructed of 10 gauge steel. One (1) personnel door, 2′ 6″ W X 6′ 6″ H, is supplied for easy accessibility for servicing of the room interior. It includes safety limit switches to prevent operation of blast pot if door is open. 2′ X 4′ four bulb, 110 volt, fluorescent light fixtures with lexan covers. Two (2) 9″ diameter long screw assemblies with 1/4″ flighting and flange bearings. Screws to be driven by 3 H.P. screw drive assemblies including reducers and TEFC motor. These drives are shaft mounted. No chains and sprockets anywhere in the system so every conveyor has it’s own drive. One (1) 9″ diameter cross screw assembly with 1/4″ flighting and flange bearings. Screw to be driven by a 3 H.P. screw drive, shaft mounted assembly including reducers and TEFC motor. Floor pans constructed of 10 gauge steel are located under the floor grating. They receive the used abrasive and refuse passing through the floor grating. All required floor grating rated at 250 #. 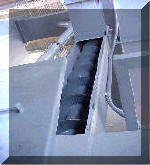 One (1) elevator, 18′ H, receives the used abrasive and refuse through a non-choke infeed spout at the elevator boot. The elevator drive unit is located at the head. It consists of a shaft mounted gear reducer, driven by a 2 H.P. electric motor. One (1) high efficiency, high capacity abrasive separator, consisting of the lower air wash section and rotary screen driven by a 2 H.P. shaft mounted motor. The material received from the elevator is deposited into a rotary screen then an adjustable metering gate and is allowed to fall in a uniform curtain through the air wash section. One (1) 80 Cu. Ft. steel plate abrasive storage bin with divider, handrails and ladder, to receive the cleaned abrasive from the foregoing separator and stores this material for distribution, mounted over the blast tank, feeding thereto. The blast application is accomplished by two (2) 6.5 Cu. 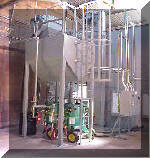 Ft. single chamber blast pots with controls and 1 1/4″ piping for grit control. Two (2) 3/8″ nozzle blast controls for starting and stopping the blast at the end of the blast line, stops if the operator releases the actuator for any reason, providing operator safety. Nozzle control interlocks with door limit switches to prevent pot operation unless all doors are closed. Two (2) supplied air systems consisting of the helmet assembly with shroud, breathing tube and regulation valve with quick disconnect to helmet from compressed air line. 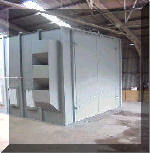 One (1) cartridge type down flow dust collector with pulse air blow down for cleaning filters. One (1) pre-wired and interlocked NEMA 12 electrical control panel, including starters, fuses, push buttons, main line disconnect, etc. for the proposed room.